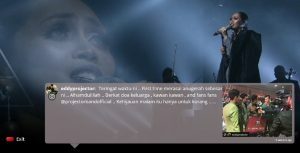 The AJL final concert is annual event broadcasted in TV3 channel of Media Prima which recognized the musical composition of a song based on the collaborations of three parties – lyricist, composer and the artiste. Before the final concert weekly programme will gather singles and songs nominations from various artistes where they will compete till their songs will be included as the AJL finalists before ultimately nominated to be judged by professional judges. The AJL song contest recorded with Dolby Digital Plus technology enables also Video-on demand library containing all previous year’s songs with high quality 5.1 multichannel audio. The video content encoded with MPEG DASH adaptive streaming allows users to see the streaming video and advanced audio even with slower under 2Mbit broadband connections while high-speed Internet households can access to HD quality video and Dolby 5.1 Surround Sound. One example of extra service for Digital Televisions with Internet connection is to use and see Social media services, such as Twitter and Instagram, integrated with the TV content using Sofia Digital SOMESCREEN®. TV viewers may choose if they like to follow social media postings connected to the AJL event top of the live TV feed. 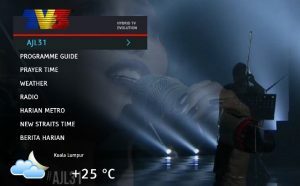 The event moderator at Media Prima TV station can choose from the selected hashtag such as #AJL31 the best comments to be promoted on the TV screen and create on-demand polling, where viewers can vote and participate to polls with their TV remote controller or using their handhelds companion devices. Sofia Backstage® Author tool was used to generate AJL video-on-demand portal containing AJL songs and other extra video material. Authoring tool is integrated with Dolby Encoder allowing the media files converted into MPEG DASH format supporting Dolby Digital Plus technology. Thanks to Sofia Backstage® Author, rapid service creation and management is possible enabling e.g. easy versioning of the application for each year’s AJL contest. Sofia Backstage Author also allows easy uploading of video content and transcoding to HbbTV compatible MPEG-DASH video format and simple editing of the ready-to-use content templates of applications hosted in the tool. Sofia Backstage® for HbbTV enables full end-to-end workflow to creation, delivery and hosting of interactive TV services, launched from by the remote controller. Sofia Digital brings your content and services to different terminals. We focus on open standard interactive platforms and well-known Internet technologies. Our core competence are TV services, made available both in broadcast network and OTT. Sofia Backstage® Product range is available from standalone smart TV apps and laboratory services to professional broadcast service management and automation tools as well as digital signage and social media integration. Company solutions utilize HTML5, HbbTV and DVB standards and are pre-integrated with many leading technology providers in the TV industry. Dolby Laboratories (NYSE:DLB) creates audio, video, and voice technologies that transform entertainment and communications in mobile devices, at the cinema, at home, and at work. For more than 50 years, sight and sound experiences have become more vibrant, clear, and powerful in Dolby. Dolby Digital Plus is an advanced surround sound audio technology that enables the Dolby Audio experience across home theaters, smartphones, operating systems, and browsers. Dolby Digital Plus is a trademark of Dolby Laboratories. Media Prima Berhad is the leading fully-integrated media company in Malaysia. With a complete repertoire of media-related businesses including in Television, Print, Radio, Out-of-Home, as well as Content and Digital Media, Media Prima, which is listed on the Main Board of Bursa Malaysia, is also one of Malaysia’s Top 100 largest listed companies by revenue. Media Prima TV Networks operates Malaysia’s four leading free to-air television stations namely TV3, Malaysia’s No. 1 television station in the country; TV9, popular amongst Young Fresh Mass Malays; as well as 8TV and ntv7, No.1 and No.2 leading channels for the Chinese and Urban demographics.